Just 15 minutes from the airport these 48 equipped offices and open spaces are situated in the heart of an exceptional business park in an exceptional innovative building with the latest high tech facilities. It is ideally located in the middle of the technological hub, in the Green Side company village opposite the Saint Philippe Golf course. This centre is the perfect destination for businesses with international contacts or visiting executives. This large, sunny centre has stunning contemporary architecture and boasts a range of bespoke services and high specification office spaces fitted with state of the art technology. The property has a sophisticated business lounge, a beautiful landscaped atrium area and on-site car parking. It is located near the city centre and has excellent motorway links. Whether your company is a start-up or a growing company, here you will be well equipped to enable your business to flourish. 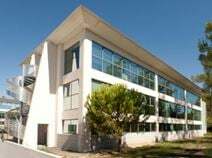 In the heart of Sophia Antipolis technopole with quick access to both the A8 motorway and Nice Côte d’Azur International Airport, this brand new positive energy building provides a range of fully furnished offices equipped with the latest technologies from 10m² up to 200m². This centre provides IT and telecommunication high tech solutions with call answering services and mail handling. The reception team will also welcome your customers/visitors and assist with administrative tasks. In one of Europe's first specialist IT and technology parks on the French Riviera, this business centre offers open-plan office space with large windows and an endless abundance of natural lighting. Surrounded by both start-up and global companies and just 30 minutes from Cannes station. Here, your company can use meeting rooms, business lounges and a secretarial team. The space is accessible 24/7, allowing you to work as you please. modern and offbeat business centre that offers all-inclusive monthly subscriptions in private offices and atypical workspace. Ideally located in the heart of the Sophia Antipolis Technology Park, this center provides a premium working environment for all these customers. Only 10 minutes from the A8 motorway and 20 minutes from Nice Côte d'Azur airport, this center is accessible 24 hours a day, 7 days a week by personal access badge. The reception is provided from 9am to 12pm and from 2pm to 6pm. Eco friendly brand new building in one of Europe's first specialist IT and technology parks on the French Riviera, this business centre offers open-plan office space with large windows and an endless abundance of natural lighting. Surrounded by both start-up and global companies and just 30 minutes from Cannes station. Here, your company can use meeting rooms, business lounges and a secretarial team. The space is accessible 24/7, allowing you to work as you please.